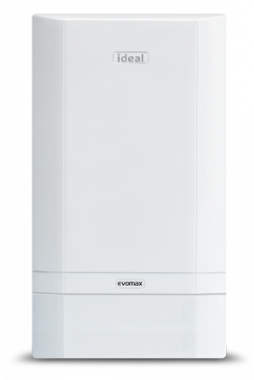 DISCONTINUED.The EvoMax boiler is a condensing, regular gas boiler by Ideal. Also known as a heat only boiler, it incorporates extended controls and a hot water cylinder which is fed by a cold water storage cistern and an expansion cistern, both of which are located in the loft. This is a highly reliable boiler with key features including a robust cast aluminium silicon alloy heat exchanger a high 5:1 turndown up to 110% part load efficiency and NOx <40mg/kWh (class 5) for natural gas boilers. These features deliver a high efficiency rating of 96.6% making it an A rated unit. All components have been carefully selected to enable straightforward installation and servicing. This boiler comes with a wide range of features which mean installation options are flexible. It is compact in size and, because of the optional frame and header kit that offers in line and back-to-back cascade options, can be either wall-mounted or floorstanding. This range of boilers comes with a variety of options to suit your home including the choice of natural gas or LPG, as well as a wide range of output options: 30kW, 40kW, 60kW, 80kW, 100kW, 120kW and 150kW. This particular unit is a 120kW boiler which is perfect for larger properties with a high demand for hot water. This boiler also features a 5 year warranty on parts and labour so you can be sure you have purchased a highly reliable boiler.